Drug recovery is a difficult but rewarding road and can be made even easier with a healthy diet. Check out this guide to making your perfect drug recovery diet. Opiate substance abuse severely impacts individuals and families. Opiate addiction weakens organ function and imbalances an addict’s metabolism. Among other symptoms, a person suffering from opiate abuse can experience diarrhea, nausea, and vomiting. These symptoms can affect the balance of electrolytes in the body, specifically potassium, sodium, and chloride. A proper drug recovery diet with the appropriate nutrients and vitamins can help the body recover, fight infection and strengthen your internal organs. But a recovery diet for a newly recovering addict isn’t always welcomed with open arms. The person in recovery is often dealing with withdrawals, emotional stress, and psychological changes. A healthy diet could be the last thing in the recovering addict’s mind. When a person begins a recovery diet, they develop cravings for foods that are bad for them. Some of these foods include candy high in sugar, foods with high salt and foods high in fats. 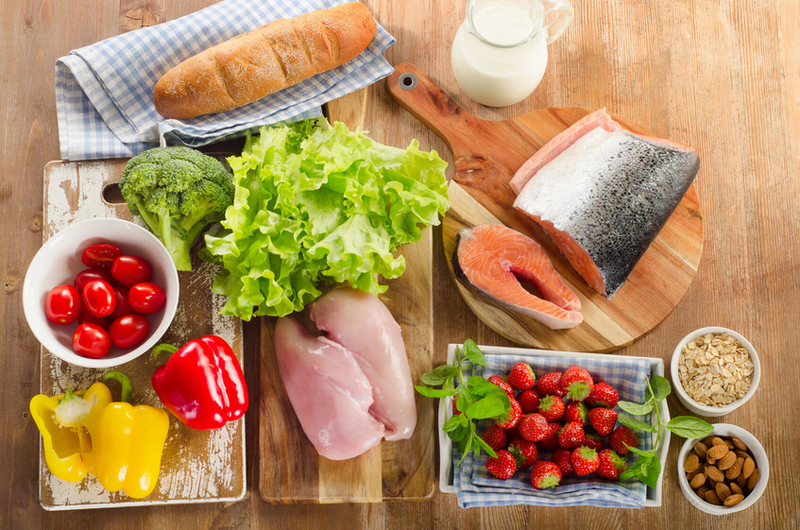 The good news is there are foods for a drug recovery diet that can help strengthen the body and mind and get you or your family member back on the road to wellness and a healthy lifestyle. But it’s important for family members to realize the process their loved one is experiencing. It takes time. Families need to exercise patience and emotional control when their family member begins their drug recovery diet. Here’s what you need to eat and do to manage the ideal drug recovery diet. Consistency builds discipline and is good for the body, mind, and spirit. Set mealtimes at the same time every day. This means for all three meals: breakfast, lunch, and dinner. Be sure not to skip breakfast because a healthy breakfast will get you off to a good start for the day. While a cup of coffee or caffeinated tea in the morning might feel like it gives you a quick pick me up, caffeine has negative effects on moods. Caffeine found in coffee, teas, and soda, stimulates the central nervous system. It releases serotonin and dopamine from the brain. These are two good chemicals we need to keep in the brain. Caffeine can also make us feel anxious and irritable. For these reasons, eliminate caffeine, or at least reduce your intake of caffeine on your drug recovery diet. Although the body needs some sugar from fruits, too much glucose is harmful to the brain. High-sugar diets impact mental health. Sugar impairs the brain’s ability to cope with stress. It also increases anxiety. After coming down from a sugar crash, a person can experience depression. This can worsen the efforts of a healthy recovery diet. This is why it’s important for a person on a diet to avoid sugar, especially foods high in fructose. Folic acid lifts the mood naturally and can reduce stress. It’s a vitamin called B9 and has many positive health benefits. It’s good for the heart and can fight against cardiovascular disease and prevent heart attacks. Some of the foods that are high in folic acid include asparagus, spinach, oranges, beans, and leafy green vegetables. Folic acid can also aid the treatment of depression. Folic acid supplements have been prescribed by doctors to enhance depression medication. Some nuts combat depression, stress and help eliminate anxiety. Three nuts good for you are cashews, almonds, and walnuts. Cashews help the body feel good naturally. That’s because they contain zinc. Zinc fights depression and depression increases worry and anxiety. Almonds also are stress fighters. Almonds contain zinc, magnesium, Vitamin E, and selenium. These minerals and vitamins have a calming effect on the central nervous system and help fight moodiness. Did you know that people who lack selenium are more apt to be prone to depression and anxiety? Have an evening meal with cashew chicken. Take the skin off the chicken to remove the fat, bake the chicken and serve with a side of asparagus rich in folate acid. Serve it with a glass of decaffeinated tea to wash it down. Salmon is good for you and your body because it is rich in Omega 3 acids. Salmon helps to decrease adrenaline and lowers anxiety. It also manages cortisol levels, a hormone that lowers stress and glucose levels. For a quick meal, put a little oil in a wok or large pan and place your salmon in the pan. Add some low sodium soy sauce and a slice of ginger and a clove of garlic. When the salmon is almost done, toss some fresh spinach into the mix. (Spinach is rich in magnesium and balances cortisol levels, which help stress.) Add a slice of lemon. Serve a side salad of leafy green vegetables with a salad dressing low in fructose—or make your own with vinegar and oil mixture. A perfect breakfast meal in your drug recovery diet, oatmeal is so good for the body and it doesn’t have to be dull! Add your favorite fruits to sweeten it up! Oatmeal is a healthy grain that contains calming properties that reduce stress and anxiety. That’s because oatmeal is high in serotonin, which is a neurotransmitter that regulates the brain. Cook up some oatmeal in a pan or the microwave. Add a banana that is a good source of potassium and a handful of blueberries, one of the best fruits, rich in antioxidants, anthocyanins, and Vitamin C. Splash in a touch of milk, which relaxes the body once the milk gets warm. These three meals provide a good start for your drug recovery diet while you begin your journey on the road to good health, happiness, and recovery. Our recovery centers in Los Angeles, CA are dedicated to providing a warm, loving, and healthy environment on the path to your recovery. If you or your family member needs heroin rehab, opiate detox or suffers from a painkiller addiction, contact us today to learn how to get help.